New Delhi: Centre for Civil Society (CCS), India’s leading Think Tank advocating social change through public policy in partnership with India’s first Hindi liberal web portal Azadi.me launched the Hindi translation of Frederich Bastiat’s book ‘The Law’.­ The book written by the acclaimed writer, economist and one of the most seminal thinkers of the classic liberal tradition,was first published in French in 1850,followed by iterations in English and Malayalam. 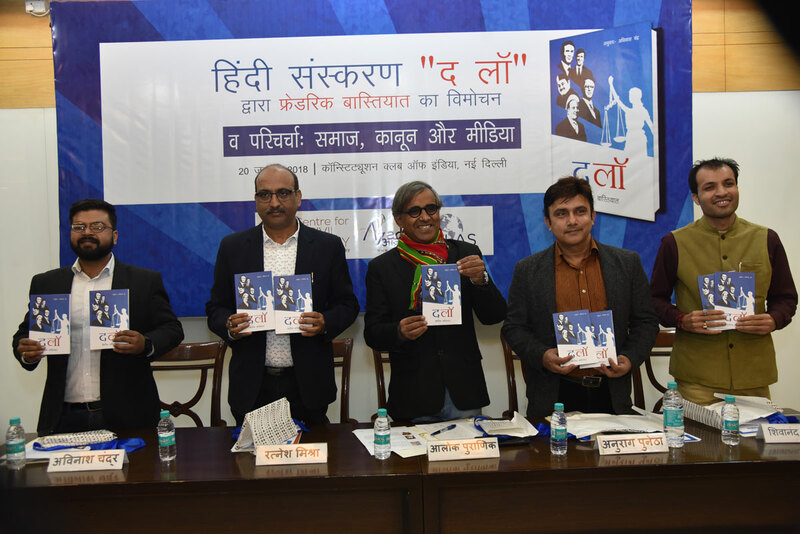 Translated and edited by Avinash Chandra, Editor, Azadi.me, the translation and launch of the book aim to bring an accurate rendering of Mr Bastiat’s words and ideas into twenty first century, idiomatic Hindi for hindibhasis around the world. To mark the occasion, a panel discussion on ‘Society, Law and Media’ was organized during the media launch of the book at the Constitution Club of India on Saturday, featuringmedia veterans and India’s leading industry experts such asRatnesh Mishra,Resident Editor, Rashtriya Sahara; financial expert Dr. Alok Puranik, Associate Professor, Delhi University; Anurag Punetha Senior Anchor, LoksabhaTV TV;Shivanand Dwivedi, Fellow, Syama, Prasad Mukerjee Research Foundation & Editor of Nationalist Online and Avinash Chandra, Editor; Azadi.me.Reading experts from the book, the panellists discussedhow Bastiat’s political theories have relevance to democratic republics of any era and how different government policies frequently subvert the rule of law. Shivanand Dwivedi criticized the socialist system and discussed how we must make laws that proactively catapult society forward rather than those that just passively watch over it.Avinash Chandra, Editor, Azadi.me, quoting Frederich Bastiat said that most laws are made to protect and benefit one particular section of the society at the cost of another. To mitigate the same the panel concluded that free market constructs are the best solution in the current economic environment.